A nicely roasted piece of beef is rich and flavorful in its own right, but it's all the better with a few well-chosen accompaniments. Chief among the traditional choices is horseradish sauce, its tart and fiery pungency acting as a foil to the richness of the meat, gravy and side dishes. Commercial horseradish sauces are often bland, but a sauce fresh-made at home -- from prepared or fresh horseradish -- requires little effort, and packs a greater punch. 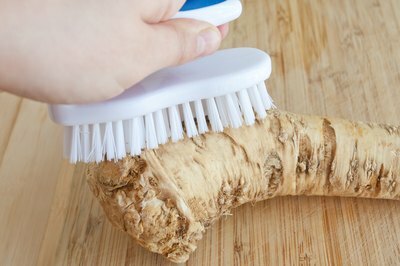 Scrub the root with a stiff brush to remove any soil from its many crevices, and then peel it with a sharp paring knife. 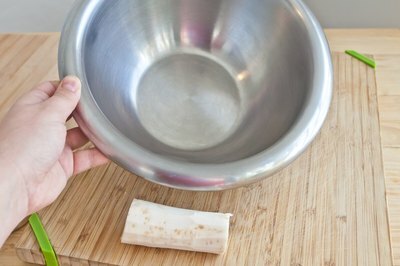 Place a stainless steel or glass bowl on your work surface, and pull on a pair of disposable kitchen gloves. This is optional, but gloves stop your hands from smelling of horseradish -- or accidentally transferring the juice to your eyes or nose -- the rest of the day. 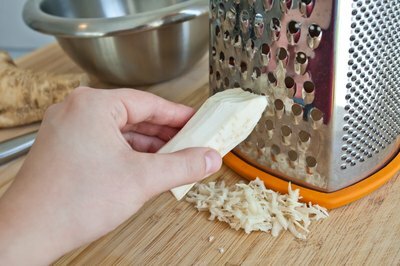 Open any nearby windows, because the freshly grated root is very pungent and will quickly become overpowering in a closed space. 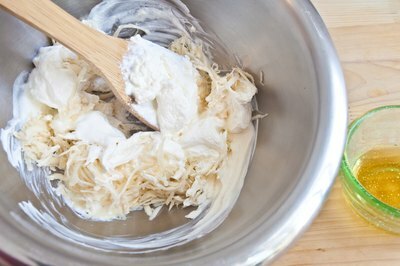 Shred the horseradish root into the bowl, working as quickly as possible to minimize the quantity of pungent vapor in the air. 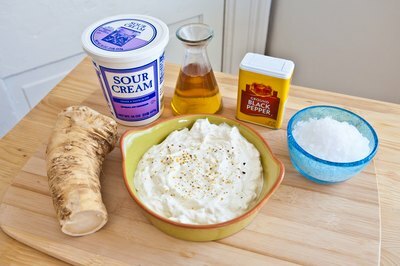 For every 1/4 cup of horseradish, add a cup of sour cream or creme fraiche and roughly a teaspoon of white vinegar. Stir the mixture; season it lightly with salt and pepper, and taste it. It should have a sharp but balanced flavor, with a bright tang from the vinegar and sinus-clearing heat from the horseradish. Add cream, vinegar or salt as necessary until you're happy with the flavor. Refrigerate the sauce for at least 20 to 30 minutes so the flavors can mellow and mature, before serving. Use the finished sauce within two to four days for the best flavor. Horseradish is hot and peppery on its own, but adding Tabasco or other types of hot sauce creates a fiery hot horseradish.